There are many things in life that one should really rise above and not respond to. One such thing, in my humble opinion, is the Daily Mail. But this morning I took the unusual step of actually reading something in the Mail (don’t worry, I thoroughly washed my hands afterwards) – an article that was highly critical of the National Trust. In it, the writer, one Harry Mount, criticises the Trust’s Egg Hunt over Easter weekend, which I’m sure you have read about in the press over the last day or two (it was a story that even caught the Prime Minister’s eye), but goes on to criticise the Trust for ‘dumbing down’, having a ‘childish world view’ and the inevitable allegations of ‘political correctness’. So what are the evils perpetrated by the Trust to deserve such attacks? Well, apparently they have dared to put up posters for their events. This seems to be a key criticism that Mount returns to again and again. ‘Advertising’, he says, ‘trumps beauty’. 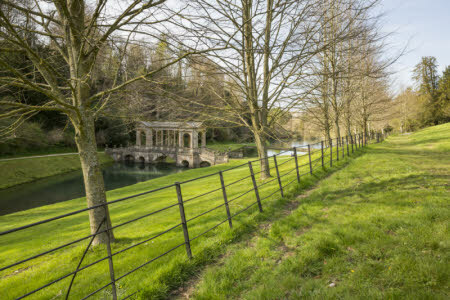 Well, I dare say that the railings at Prior Park do look better without a poster, but as man cannot live by bread alone, the Trust cannot draw life merely from the beauty of its railings. More and more of us in the museum and heritage sector know and have experienced the pain of cuts, and the resultant imperative to be more commercially active. Hooray for the National Trust and their attempts to raise the money that will enable them to preserve and give access to our beautiful buildings and landscapes for generations to come. OK. That’s posters. What else? Oh, a sign that indicates that Osterley Park ‘welcomes dog walkers’. Why do we need this, asks Mount. Dog walkers and runners ‘already know that they can freely do these things’. Do they? Do they really? I must get a dog or take up running. I had no idea that psychic ability was bestowed upon canine-loving and sporty types. The point here is that lots of people do not know that they are welcome. They often think such places are not for them. They are sometimes intimidated by them, often they might just think they have to pay to go in. There are many reasons why people may not visit. Hooray for the National Trust letting them know that they are welcome. Now then, what comes next? Oh yes, Prejudice and Pride, the Trust’s project to expose the stories of LGBT people at some of their properties. This is not our first run in with the Daily Mail on this issue. We, at the School of Museum Studies, are proud to be part of this project, working with the Trust to support them in this endeavour. It’s breaking ground for the Trust and for many museums who do not tell (some even actively conceal) LGBT stories. These stories deserve to be told as much as anyone else’s. It is so important for LGBT people (and other minorities) to be able to find their stories represented in museums, historic houses and other sites. LGBT people exist too. Don’t try and airbrush them out of history. Their stories matter. Hooray for the National Trust being pro-active in uncovering and telling these stories. Back at Prior Park, Mount is perturbed to find a sign which invites visitors to ‘think how each area of the garden makes you feel’. He seemingly doesn’t like feelings or the idea that ‘religion, facts, history and beauty fall victim to political correctness and emotional responses’. But what is beauty if not an emotional response? Are our responses to stunning works of art (or houses, or pieces of furniture or objects and artefacts) dispassionate? Of course they are not, our responses to such things are full of emotions. At a very simple level, whether we like or dislike something is an entirely emotional response. Thinking about emotions is a brilliant way of engaging people more deeply with their history and heritage. Hooray for the National trust supporting people to have interesting, stimulating, emotional experiences at their properties. Just up the road from us here at Southwell Workhouse, according to Mount, the Trust had a Christmas event at which visitors were ‘invited to “sing along with the pauper choir”’. Mount doesn’t say why this is bad (you might have thought he would applaud a Christmas event, given his vociferous opinion on Easter Eggs), but he does tie it in with Halloween events and a Cluedo-themed events at other properties, which are, apparently, examples of ‘replacing history with childish fantasy’. Well, to me they are examples of ways in which we can engage new audiences, invite people to come together and participate and celebrate in their heritage. Things they might not otherwise do. Hooray for the National Trust creatively engaging new audiences, giving life to properties and making the Trust more sustainable for the future. The article also accused the Trust of becoming an eco-charity. The evidence for this? The Trust’s director, Helen Ghosh, saying that ‘Extreme weather is the largest threat to our conservation work’. Well, anyone with a basic knowledge of conservation will know the potential effects of extreme weather. Heat, water, very high, low or rapidly fluctuating relative humidity are key agents of decay. Our changing climate is an issue for all museums, in terms of how they can be more sustainable, but also in how they rise to the challenges that climate change brings. Hooray for the National Trust being aware of, and thinking about how they, in line with their mission, and in the light of these challenges, can preserve our heritage for future generations. And finally, what of the Egg Hunts? Well, it strikes me that if you participate in a hunt for chocolate eggs on Easter Sunday, it’s really up to each individual whether they choose to associate that with the resurrection of Christ or not. For myself, I’ll just enjoy the chocolate if that’s OK, Harry. I have not always been the greatest fan of the National Trust, but right now I see a rapidly changing organisation that is not only preserving the past, but it is making it more and more accessible to more and more people and thinking about and addressing important contemporary social issues. The end result should be more and more people are able to appreciate, engage with and understand their heritage. And if that is the case, then, one last time, I say “Hooray for the National Trust”. If you are interested in the themes of this post, or other issues facing heritage sites and the people who work in the heritage sector, you may be interested in our masters of postgraduate diploma in Heritage and Interpretation. Hooray for the National Trust! Hooray for the School! Hooray for Rob! Thanks for the lovely comment, Kalliope!